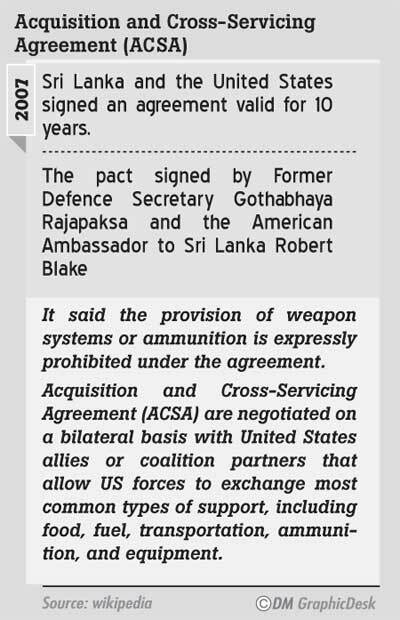 Daily Mirror - Does signing an ACSA with USA pose danger to Sri Lanka? 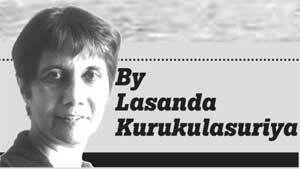 Does signing an ACSA with USA pose danger to Sri Lanka? 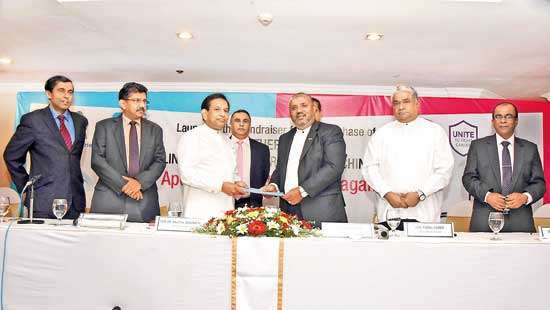 Prime Minister Ranil Wickremesinghe has stated in parliament that the government would renew the Acquisition and Cross Service Agreement (ACSA) with the United States which had lapsed in March this year. 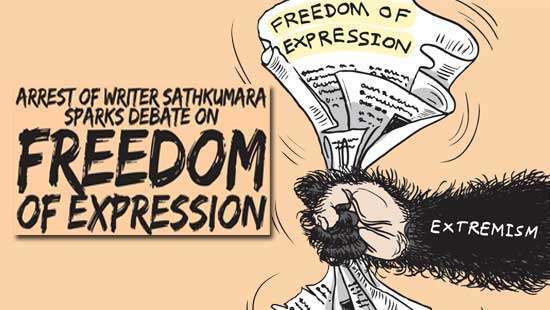 Apart from asserting that such bilateral agreements are ‘important’ for Sri Lanka in the current international context, he gave no details regarding substance or amendments in the new agreement, which is yet to be made public. When the previous 10-year ACSA was signed in 2007, a war situation prevailed in Sri Lanka when it could have been argued there was some benefit to the Sri Lankan side. But the new agreement will be operative in a peace-time situation where the advantage to Sri Lanka could be questionable. For the US on the other hand, securing access to ‘logistics support, supplies and services’ in this part of the world at a time when its strategic focus has shifted to the Pacific and Indian Ocean regions, would have undoubted benefits. According to the information available on the 2007 ACSA, ‘logistics support, supplies and services’ where mutual cooperation is undertaken refers to areas such as food, water, billeting, transportation - including by air, petroleum, clothing, communication services, medical services etc., as well as base operations support, use of facilities, training, spare parts and components, repair and maintenance and port services. It may be seen that in the event of a confrontation with another state in the region it would be very useful to the US to have such access, in a strategic location such as Sri Lanka. ‘Weapons systems’ and ‘major items’ of military equipment are expressly excluded from the agreement– but then, Sri Lanka does not have ‘weapons systems,’ or military equipment anywhere near the scale and sophistication of the arsenal of the world’s superpower (which includes nuclear weapons as well). So what this ‘exclusion’ really means is that the US will not be obliged to share its military expertise and assets with Sri Lanka. "The Americans and Indians would be in Trincomalee, while the Chinese were in Hambantota. Although the SL government says ‘no military use’ of its ports would be allowed, Prof. Vitharana warned that if a military confrontation broke out in the South China Sea, for example, Sri Lanka could get unnecessarily caught up in a big power conflict"
“In addition to host nation supplies and services, ACSA can give US access to basing and infrastructure necessary for force projection in and through the USPACOM (US Pacific Command) area of responsibility” wrote two US army officers in a 2004 position paper presented to the US Military War College in Pennsylvania. “Agreements of this nature continue to prove critical as countries in the USPACOM area of responsibility currently provide access in support of Operation Enduring Freedom and Operation Iraq Freedom” they wrote, referring to attacks launched by the US in wars against Afghanistan and Iraq respectively. The paper, titled “United States Security Strategy for the Asia-Pacific Region,” refers to the military benefits of ACSAs that give vital access to other countries’ infrastructure and other facilities during a time of conflict. PM Wickremesinghe’s assertions that “It is not a defence agreement” and that “we haven’t left the Non-Aligned Movement’ give rise to some scepticism in the light of such analyses coming from the US military establishment. “The alliance which we are forming with the US is not only going to be costly to us, but also endangers national sovereignty and independence” warns LSSP leader Prof. Tissa Vitharana. 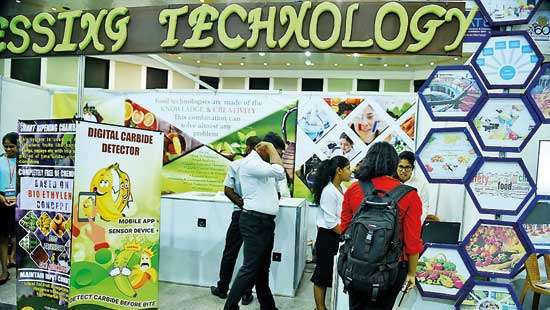 The veteran leftist has repeatedly drawn attention to the signs indicating the US is moving towards establishing a military base in Trincomalee. “Not only the paperwork but the actual process of getting together in military manoeuvres” is taking place he notes. Apart from frequent visits by US warships, joint exercises with our sailors are taking place. He referred to the ‘Second edition of Staff Talks’ between the high ranking officers of the US 7th Fleet and SL Navy held in May at the Sri Lanka Naval Headquarters, where discussions were reported to have highlighted the importance of furthering the mutual cooperation between the two naval units. “These exercises are gathering momentum” he said. Prof. Vitharana referred to several statements from US officials that revealed their interest in setting up a base in Trincomalee. The present US ambassador had listed his priorities at the time he was appointed (as ambassador elect) and second on his list was the setting up of this base, Prof. Tissa Vitharana told the Daily Mirror. He said further confirmation that the government was moving in the direction of making Sri Lanka “a part of the military machine formed by the US to control the world” could be seen in Premier Wickremesinghe’s statement in April last year, addressing a Commissioning parade at the Naval Academy in Trincomalee, that the Sri Lankan armed forces would have to ‘protect the Indian Ocean from the Maldives to the Straits of Malacca.’ The Premier pledged to buy more ships and weapons to facilitate this exercise. Prof. Vitharana pointed to the irony of suggesting such a course of action at a time when the country was deeply indebted, having sought $1.5 billion from the IMF with the entire attendant conditions “for neo-liberal changes that would enable US exploitation of our economy.” This situation is fraught with danger he said, though nobody is talking about it. For statements on US intentions in the Indian Ocean region, which would seem to reinforce Prof. Vitharana’s arguments, one only has to look at the keynote speech made by the Commander of the US Pacific Command, Adm. Harry Harris at the Raisina Dialogue in New Delhi in January. “I believe the U.S. and India can truly shape the New Normal – indeed, must shape it – because I guarantee our adversaries are trying to do so” said Harris. Describing what he called the ‘Global Operating System’ (shaped by US interests, one would infer) he said “Our leaders have affirmed – and I too believe – that the deepening US-India relationship will be the defining strategic partnership of the 21st century.” The challenges he identified to this Global Operating System in the Indo-Asia-Pacific were the ISIL, North Korea, Russia and China. (So it appears the Operating System is not entirely Global). Against this background, the fact that so little is known about the contents of the proposed ACSA is a cause for worry. Aren’t the public entitled to be informed and to be allowed wider discussion before a decision is taken to sign an agreement that could compromise the country’s sovereignty and independence?